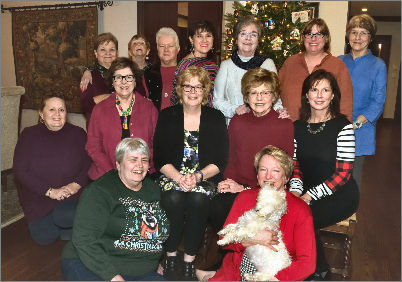 The Silver Needle, an independently owned needlework shop specializing in counted cross stitch, has been in business since 1983. 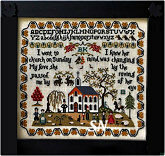 We have 4,000 square feet of everything Cross Stitch! Tons of stitched models, lots of neat scissors, luscious fabrics and threads, and beautiful Vera Bradley totes and organizers. Silver Needle is a Vera Bradley Gold Retailer. In 2011 we added the line of ladies apparel -- FLAX. It is a collection of organic linen clothing -- it just seemed perfect for us linen-loving stitchers!!! We are the ONLY FLAX retailer in all of Oklahoma!!! The pics you see on these pages are some of the shop gals, our displays and some of our favorite customers, who were kind enough to let us include them in the pics! We have skeins, spools, balls and hanks of cotton, silk, wool and metallic and overdyed threads. Some of our featured companies are Rainbow Gallery (Fyre Werks, Alpaca, Very Velvet, Wisper are just a few of their threads), DMC -- both floss and Perle Cottons, Kreinik Metallic Braid and Blending Filament... Gentle Art Sampler Threads and Gentle Art Simply Wool, Weeks Dye Works hand-dyed flosses, Perle Cottons, and their line of Hand-dyed felted wool. Classic Colorworks hand-dyed flosses and Perles as well. Our evenweave fabric selection is huge -- we have an entire fabric wall of 42 shelves full of fabrics ranging from 7 to 40 count. We custom cut fabric sizes, too! Enjoy Permin, Zweigart, Northern Cross, R & R, Picture This Plus, and Week's Dye Works linens and hand-dyeds. Edinborough, Belfast, Cashel, Aida, Tula, Klostern, Lugana, Jobelan, I can go on and on with names and brands, but you get the idea!! Our Scissor Collection is fantastic! We carry literally HUNDREDS of different scissors! DOZENS of styles from DOVO of Solingen, Germany - - they are our favorites! We carry Ginghers -- both the limited editions and regular stork embroidery scissors. We have Kelmscott Storklettes, and all her novelty scissors, some Sullivan's, Uncommon Scissors, Bohin from France and Premax from Italy. Magnifying Lamps by Craftlite are a popular 'power tool' for stitchers! Favorite Designers are many! We have special places in the shop for Just Nan, Lizzie Kate, The Drawn Thread, Jeannette Douglas Designs, Bent Creek, Pine Mountain, Shepherd's Bush, Just Another Button Company, Mill Hill, Vera Bradley, JBW Designs, Little House Needleworks and Country Cottage Needleworks... I could go on and on. From Antique Sampler charts to tiny ornament charts -- we have it all! We have literally thousands of stitched models in the shop -- covering the walls, tucked into corners, stuffed into the display cases, and unfortunately -- sometimes piled on top of each other on the tables because we're out of room for them all! We're home to Secret Needle Night, a monthly kit full of specialty threads and fun embellishments that is mailed to you each month. Always stitched on larger count linen, exclusive designs, we follow seasonal and holiday themes... and even toss in a recipe for something yummy! We have a comfy couch in our Vera Bradley area -- it has hosted many-a-napper over the years! There are cabinets and cabinets of beautiful totes, handbags, scarfs, e-covers for every electronic device you love, cross-stitch organizers, cosmetic bags, and great travel pieces. That little couch comes in handy for the ones you wear out while you're shopping for Vera Bradley! The website is always *up* on the computer in the shop -- it is a terrific reference tool. It's tucked on the wall behind some of our lovely FLAX clothes -- do take a look at those! We carry sizes Petite through Generous One! We're conveniently located only 2-1/2 miles off I-44 -- the old Historic Route 66. If you have a chance to stop -- we are 5 minutes from the Interstate. There are bookstores, sporting goods stores, car washes and Woodland Hill Mall as well as wonderful restaurants all around us. Our parking lot is huge... but you can drive right up to our front doors and park 8 feet from those doors. We have room for buses and RVs too!!! We even have a customer rest room that is stuffed with old shop models that we are selling!!! That always draws lots of fun comments. There are 15-ish of us who work in the shop. You'll recognize names when you call on the phone, converse via e-mail, or come in the shop -- most of the gals have been here way over 5 years -- and a few of them over 15! We LOVE our shop and our customers -- whether walk-in or 'remote' -- and love showing you all the fun things we have!! !